Ernest Ashworth was born in Huntsville, Alabama back in 1928. An early article when he first came on the scene indicated he had a quiet, unassuming manner of kindness to his fellow performers. But through the years, his ambition was to sing. He found himself a job as a member of the staff band at WEKR in Fayetteville, Tennessee, giving him a chance to display his talents. But like most country musicians, the desire to succeed in Nashville took over and he found himself a job with the Tennessee Drifters. He worked at various stations with them such as WLAC, WKDA, WSIX and WSIX-TV. A 1965 article indicates he began working with the Tennessee Drifters in 1951. Initially, it looks like his songwriting talents got the attention of the stars of the Grand Ole Opry and others such as Carl Smith, Little Jimmy Dickens, Johnny Horton, Wilma Lee Coper and Al Terry. That same 1965 article we mention above told readers that he started getting his songs recorded as early as 1955. Carl Smith recorded his "There's a Bottle Where She Used To Be". Johnny Horton reocrded "Journey With No End"
He would record the vocal demos that were sent to the artists when pitching his songs. Those demoes were heard by some who thought he had some vocal talents. The first label he signed with was MGM, recording several sides under the name of Billy Worth. At the time, Wesley Rose was his personal manager. In 1956, he appeared on the Grand Ole Opry as Billy Worth on July 30. A couple weeks later on August 13, he was on Ernest Tubb's Midnight Jamboree. 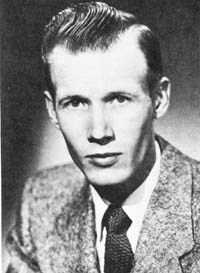 One magazine article indicates he was a factory mechanic back then when he recorded "Too Many Times" written by Melvin Endsley on MGM Records. His fan club back then was headed by Janice Schade and another one was led by George and Grovene Tucker in Fayetteville, Tennessee. He left the music scene in 1957 for a time when he joined the Redstone Arsenal in Hunstville, Alabama. It was a job that entailed working with guided missiles. But music still had a hold on him and Wesley helped him get another recording contract, this time with Decca Records. That combination appeared to work for Ernest that time. His first two releases turned into hits - "Each Moment" and "You Can't Pick A Rose In December". In 1962, he moved to Hickory Records. His first release with them was "Nobody But Me" and climbed to the Top Five spot on the country music charts. His second release, "I Take The Chance" climbed again into the Top Five. Then he recorded his classic, "Talk Back Trembling Lips", that reached the number one spot. On March 7, 1964, he became a member of the WSM Grand Ole Opry. Joining the Opry in 1964 wasn't the only reward he saw. He received two awards for Most Promising Male Country Artist from two industry publications, Cas Box and Record World magazines. In 1964, his music could be heard in the soundtrack of a movie called "Farm Girl". If you saw the movie, you heard him sing "Talk Back Trembling Lips", "Pushed In A Corner", and "Love Has Come My Way". In 1968, he told one magazine what he hoped his future would be. "I just hope I can always record songs that people will like and accept."